on the 3rd Thursday of the month. From Interstate 190N: Take Exit 5 and turn right off the exit ramp towards West Boylston. The church is located approximately one-half mile down on the right hand side. From Interstate 190S: Take Exit 5 and turn left off the exit ramp towards West Boylston. You will need to pass under the I-190 Bridge. The church is located approximately one-half mile down on the right hand side. From Interstate 290: Take Exit 23B (Route 140) toward Boylston. Follow Route 140 North for approximately six miles. The church is located on the left hand side. Parking is available in two separate lots (see map below). One is located behind the church building and is accessed by following the driveway around the church building. This lot is currently the only handicapped accessible area of the church and for parents of small children to access the church without crossing the street. A second lot is located across the street from the entrance to the church driveway and should be used for those without a safety need for close access. 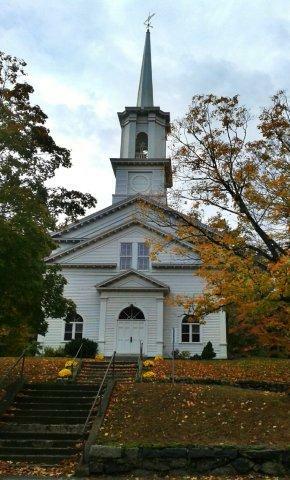 Please be kind to our neighbors and avoid parking on the uphill side of Route 140 North, across the street from the church building. High Street, next to the church building, is available for on street parking as well.